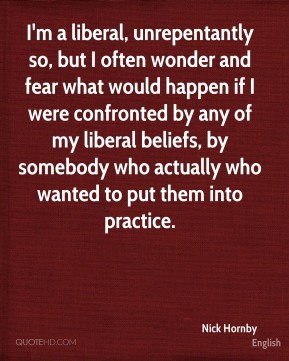 I'm a liberal, unrepentantly so, but I often wonder and fear what would happen if I were confronted by any of my liberal beliefs, by somebody who actually who wanted to put them into practice. 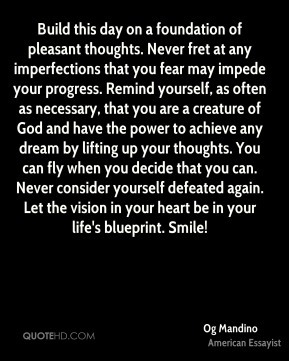 It's more excitement than fear. There's a lot more possibilities that can happen. You can pop the ball out at any time with the quarterback handling it a bit more. 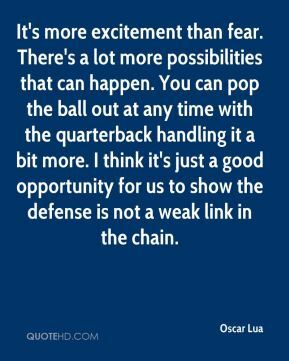 I think it's just a good opportunity for us to show the defense is not a weak link in the chain. After most natural disasters, there is a fear that dead bodies will cause epidemics. 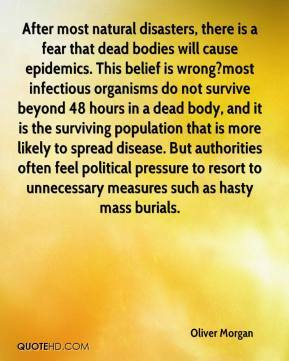 This belief is wrong?most infectious organisms do not survive beyond 48 hours in a dead body, and it is the surviving population that is more likely to spread disease. But authorities often feel political pressure to resort to unnecessary measures such as hasty mass burials. 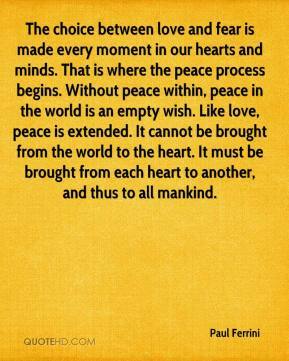 "Dread is the first and strongest of the...kinds of fear. It is that tension, that waiting that comes when you know there is something to fear but you have not yet identified what it is. 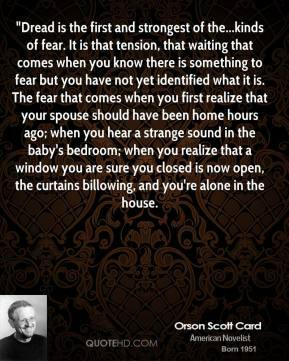 The fear that comes when you first realize that your spouse should have been home hours ago; when you hear a strange sound in the baby's bedroom; when you realize that a window you are sure you closed is now open, the curtains billowing, and you're alone in the house. A lot of them fear banks. 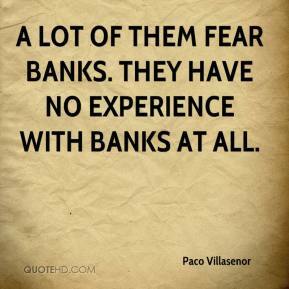 They have no experience with banks at all. 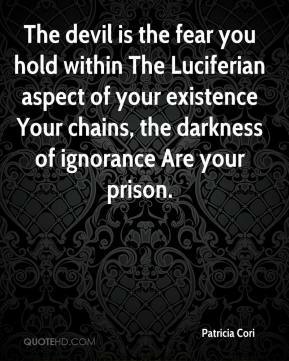 The devil is the fear you hold within The Luciferian aspect of your existence Your chains, the darkness of ignorance Are your prison. 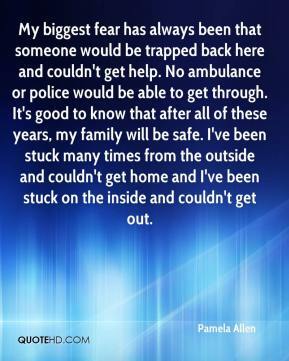 My biggest fear has always been that someone would be trapped back here and couldn't get help. No ambulance or police would be able to get through. It's good to know that after all of these years, my family will be safe. I've been stuck many times from the outside and couldn't get home and I've been stuck on the inside and couldn't get out. We went through a lot to get there. 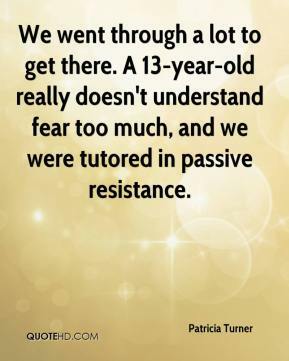 A 13-year-old really doesn't understand fear too much, and we were tutored in passive resistance. 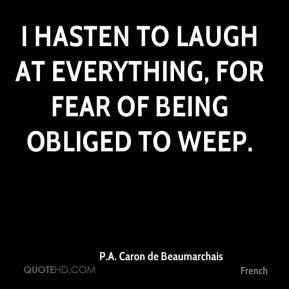 There is a fear of the unknown, ... 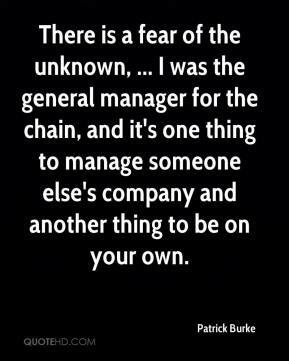 I was the general manager for the chain, and it's one thing to manage someone else's company and another thing to be on your own. 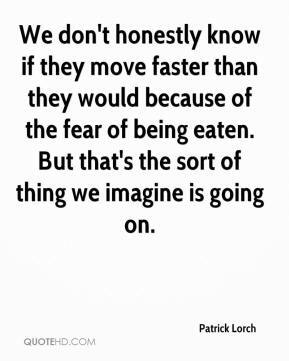 We don't honestly know if they move faster than they would because of the fear of being eaten. But that's the sort of thing we imagine is going on. It goes on behind closed doors. 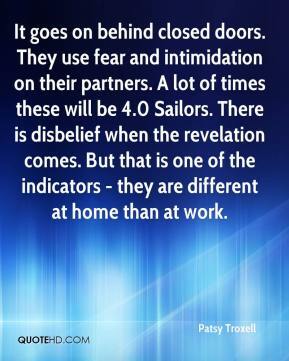 They use fear and intimidation on their partners. A lot of times these will be 4.0 Sailors. There is disbelief when the revelation comes. But that is one of the indicators - they are different at home than at work. 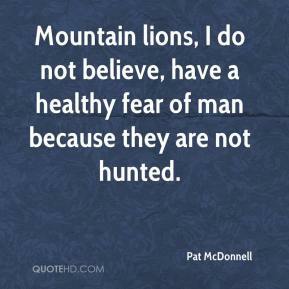 Mountain lions, I do not believe, have a healthy fear of man because they are not hunted. This is a very good outing for us. 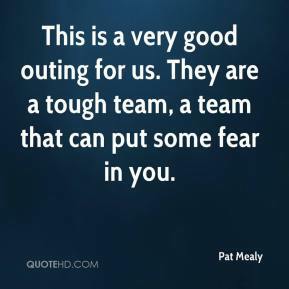 They are a tough team, a team that can put some fear in you. 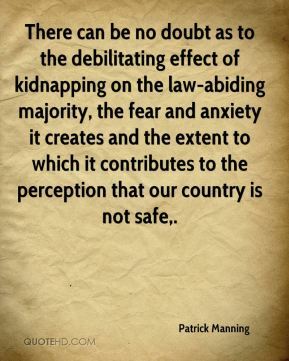 There can be no doubt as to the debilitating effect of kidnapping on the law-abiding majority, the fear and anxiety it creates and the extent to which it contributes to the perception that our country is not safe. 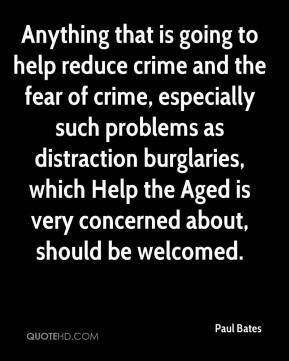 Anything that is going to help reduce crime and the fear of crime, especially such problems as distraction burglaries, which Help the Aged is very concerned about, should be welcomed. 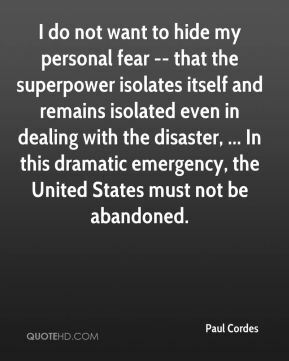 I do not want to hide my personal fear -- that the superpower isolates itself and remains isolated even in dealing with the disaster, ... In this dramatic emergency, the United States must not be abandoned. My nightmare fear is some congressman is going to seize on this and they're going to pass some laws, ... I can just see people overreacting and doing things that would invade people's privacy or tie up the Internet with so much security nonsense that innovation slows down. 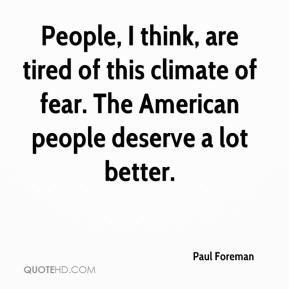 People, I think, are tired of this climate of fear. The American people deserve a lot better. 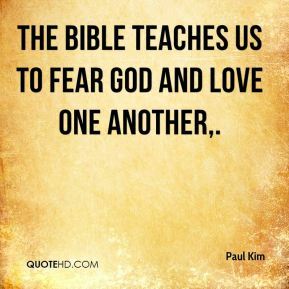 Our fear also is for the tens of thousands of other people across the Coast that has the exact same camper. 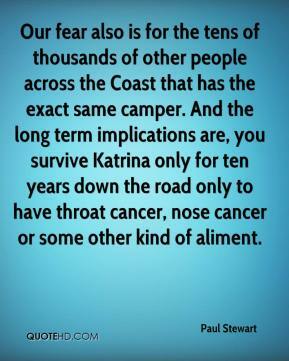 And the long term implications are, you survive Katrina only for ten years down the road only to have throat cancer, nose cancer or some other kind of aliment. 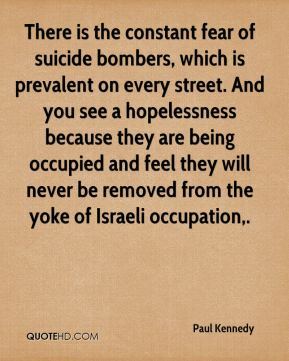 There is the constant fear of suicide bombers, which is prevalent on every street. And you see a hopelessness because they are being occupied and feel they will never be removed from the yoke of Israeli occupation.